Bring the kiwis to the boil with the sugar, the gingerroot and the lemon juice and simmer for 20 minutes on very low heat, stir regularly. Put the jam in glass jars. 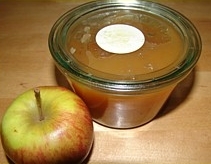 Bring the apples and the spices to the boil with the wine, and simmer on very low heat until they are completely soft. Stir regularly. Take the cloves out and puree the mixture with a fork or a food processor and add the sugar. Bring to the boil and cook until it has the right consistency. To test, put a drip on a cold dish, it is good when it no longer releases any water.